Diamond carat weight is the unit of measure used when describing a diamonds weight. 1.00-carat also equals 100 points. For example 50 points is .50 carats or half a carat. 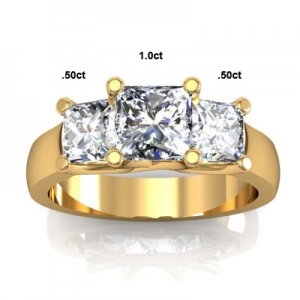 As the diamond carat weight increases, the value increase exponentially. For example, ten diamonds weighing .10 points each would equal 1 carat. 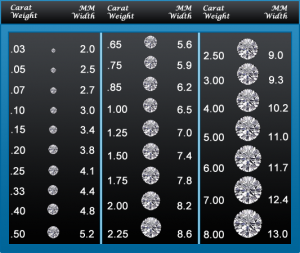 A 1 carat diamond is worth far more than these ten smaller diamonds, yet their total weight is still 1 carat. The reason for this is that larger diamonds are much more rare, therefore the value increases accordingly. What does a Carat look like? 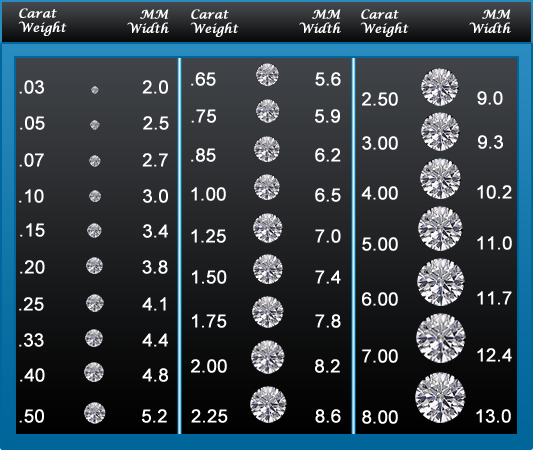 Sizes below are based on a well-cut diamond. A poorly cut 1 ct diamond can look like a .85 ct diamond from the top. The weight of a poorly cut diamond is in the depth, giving it a smaller appearance from the top than it should be. So why is this done? Simple, the heavier the diamond the more money it is per carat. However, you should expect to receive a large discount for these poorly cut diamonds versus the same size of a very good cut or better. 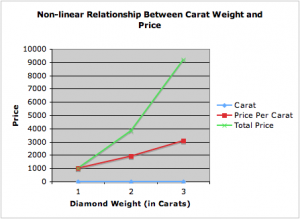 How Carat weight affects value. 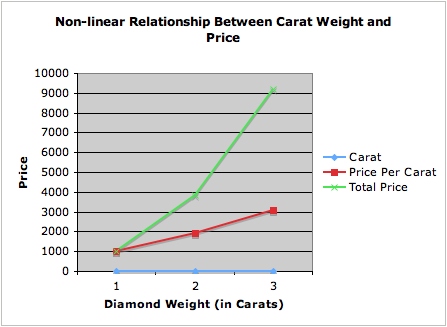 Below is an illustration how carat weights affect the value of a diamond. The prices below are per carat pricing. What is per carat pricing? It is the way the jewellery industry prices diamonds. For example: if you have 5500.00 per carat in the .60-.69 column and want to figure out the price for a .63ct diamond. You would go 5500 x .63 = 3465.00 this would be the price of a .63ct diamond in this example. Another example would be if you take in the last column for a 3carat diamond you would take 19500.00 x 3 = 58500.00 that would be the price for 3-carat diamond in this example. How much should I spend and what size of diamond should I buy? A few tips to keep in mind will help guide you to the right decision. The general rule of thumb when buying a diamond is “2-3 months salary”. This is just a guideline, it’s not carved in stone, but it’s useful in establishing a budget for how much you can comfortably invest in her diamond. Deciding on carat size is really about striking a balance between size and quality. If she prefers larger jewellery items, and you are working within a budget, you can still find a larger diamond of excellent quality by selecting one which is graded slightly lower in terms of color and clarity.